New anvil-cut loppers available from Felco Australia offer cutting power combined with lightness and strength. The new Felco 230 lever-action loppers have an official capacity of 40mm, but tests show that they are capable of significantly larger cuts. A key feature of the new loppers is their unique and innovative roll-lever action, reduces the effort required for large cuts without requiring the operator to open the handles much wider than they would with a non-levered tool. This is a significant advantage in situations where obstacles may limit the manoeuvring space. The lever ratio is also impressive. A 10kg force applied on each handle translates into more than half a tonne in the cutting head. Another outstanding feature of the lever-action loppers is their light weigh. At only 1,150 grams, they make overhead work less strenuous than heavier tools and help boost operator comfort and productivity. The straight blade of model 230 lever-action loppers has a slim profile which facilitates cutting. 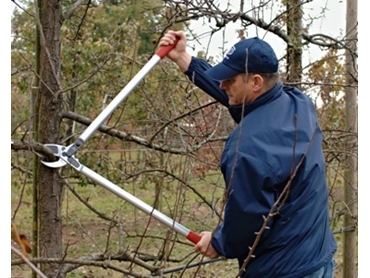 Its narrow profile makes it the tool of choice where branch access is made difficult or awkward by obstacles.